The box features some of the unique locations and people from Neenah. Featured are places such as Doty Cabin, the lighthouse at Kimberly Point, the Equitable Reserve Building, Riverside Park, the Octagon House, the Neenah Public Library, Babcock House, the ERA Building, the Council Tree and Clock Tower. Individuals featured are Theda Clark Peters, Charles Clark, Helen Kimberly Stuart and Clara Shattuck. Students in the beginning art classes taught by Lisa Dorschner and Emma Santiago worked on the project throughout the second semester. Neenah alum Sean Keepers provided graphic design assistance. The City of Neenah Landmarks Commission sponsored the project. The box was dedicated during a ceremony on May 23. Mayor Dean Kaufert, Historical Society Director Jane Lang, Dorschner and student Collin Haas offered remarks. 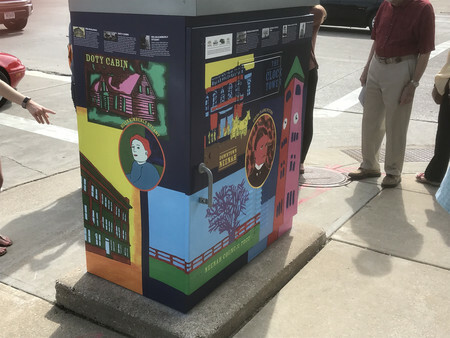 A similar box dedicated to the history of Neenah’s police department is scheduled to be unveiled on July 19 at the corner of Commercial and Cecil Streets. The students are also working with the fire department to complete another box.